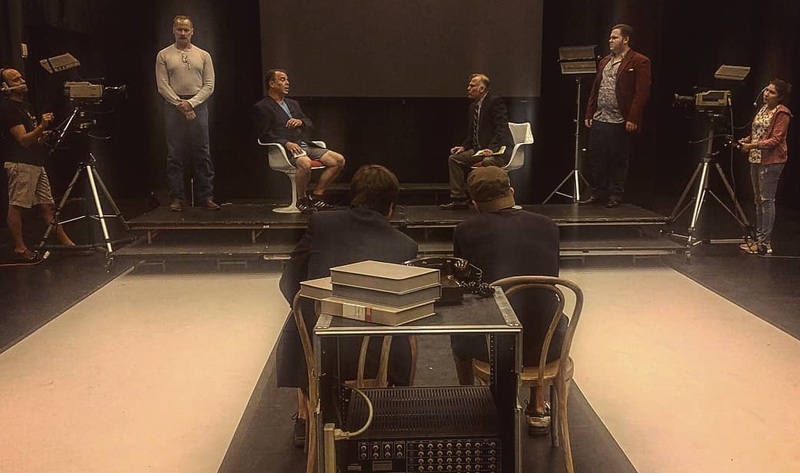 Always innovative in both choice and presentation, for the final production of its 2018-19 series, iTheatre Collaborative opened this past weekend with Peter Morgan’s historical drama Frost/Nixon, now playing at Herberger Theater Center’s Kax Stage until April 13. 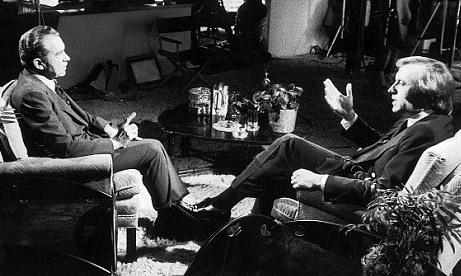 The Richard Nixon television interviews conducted by English TV personality David Frost were a series of broadcasts recorded in 1977. Because of technical transmitter issues that interfered with the California Coast Guard navigational relay system, the interviews were filmed not at Nixon’s own San Clemente home but at a long-time Nixon supporter’s seaside residence in Monarch Bay, California. The interviews took more than four weeks to record. For both men, they couldn’t have come at a better time. For Frost, his American talk show was previously canceled and there was no work in England. While presenting a show on Australian TV, the media personality saw an opportunity that he considered could re-boot a temporarily declining career. 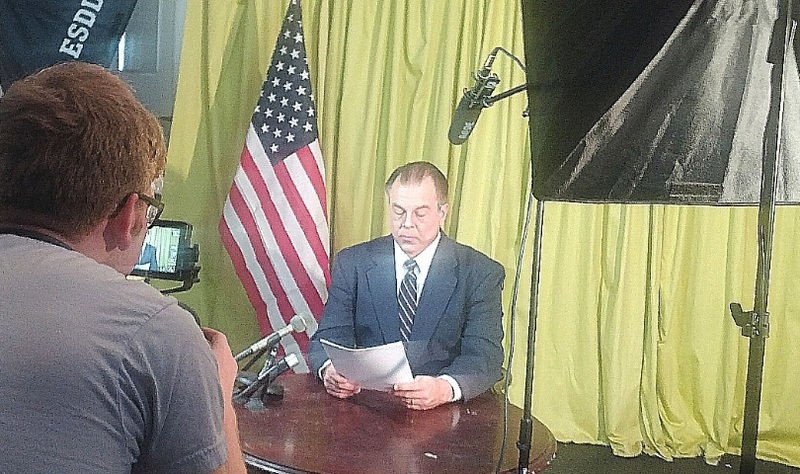 He wanted to interview Richard Nixon. For Nixon, the disgraced ex-president was fast becoming short of money to the point where doctor’s and lawyer’s bills were not being met. His agent, the famous Hollywood deal-maker Swifty Lazaar, had negotiated a deal for Nixon to write a book. When Frost approached Lazaar with the idea for a series of TV interviews, the experienced agent saw this as a means of not only promoting book sales but as a way of substantially boosting his client’s income. 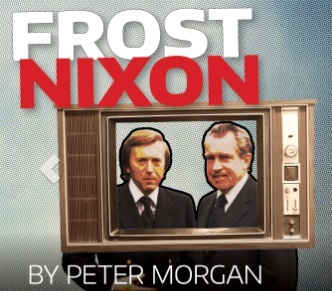 Frost/Nixon is a behind-the-scenes look at how the deal was worked and what happened when the two men finally sat down in front of the cameras and talked. Playing real-life characters is a particular kind of challenge for any actor, especially when the voices and mannerisms of that personality are so well known and often imitated. 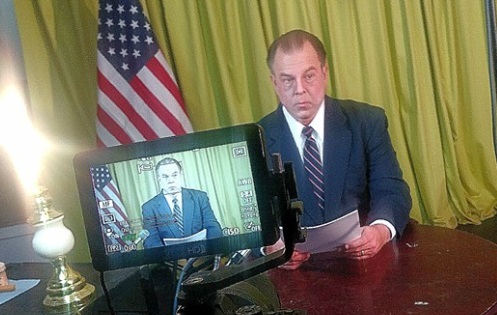 From his well-tailored appearance to the intonation and inflection of a low-toned voice, Christopher Haines does a tremendous job of embodying Richard Nixon, capturing the spirit in the way that most of us remember the man. Like all good performances, Haines doesn’t impersonate, he represents, and he does it well. Greg Lutz as David Frost is less successful, though part of the issue may be due to Peter Morgan’s portrayal of the man. The writer never quite captured the reality of what the TV personality was like. In the original production (as with the film) actor Michael Sheen injected his own style that echoed the famous media host well enough to overcome writer Morgan’s flaws. Valley performer Lutz has the unenviable task of trying to do the same, but it doesn’t quite work. Frost never followed things he said with a laugh, as the actor constantly does here. The announcer’s satirical quips were spoken straight. With a clipped accent that veers somewhere between American and faux English – ‘Wimbledon’ becomes ‘Wimbletin’ – this Frost nervously chuckles after everything he says like a guest at a cocktail party making small talk. Unlike most previous productions in Kax’s black box theatre, the house has been redesigned to accommodate a Thrust Stage setting. Audience seating is three-sided so that the downstage action can be viewed from different angles, depending upon where you chose to sit. The television segments, the Atlantic plane ride, and an unexpected late-night phone call are all played out on a raised platform upstage. It’s an interesting approach for a play that is not generally presented this way. But the execution isn’t as good as the idea. For long periods, lengthy scenes performed upstage with nothing happening on the central forum creates the illusion of too much empty space. It actually distances audiences from the play rather than achieving a sense of intimacy, which, I suspect, is the exact opposite of what the production was going for. Instead of characters constantly on the move or angled so that they can be seen at most times by all three sides, director Rosemary Close occasionally has two actors in a 50-50 position where they block each other out. It feels clumsy, resulting with audience members on the opposing sides unable to see the faces of either character. Worse, during the all-important climactic interview, two players viewing the recording remain seated on the downstage portion of the forum causing some in the first row the need to lean aside throughout the segment, cranking necks while trying to see. Peter Morgan’s script is a good example of how a writer can take a real-life event and re-mold it so that it works dramatically, even if it’s not entirely true. The build-up to the television recordings creates such an atmosphere of an exciting edge-of-your-seat drama that by the time the two men finally meet in front of the camera it’s as though two fighters had entered the ring, ready to spare. As is often the case, real-life doesn’t always lend itself to theatrical drama. It’s a writer’s job to take dramatic license and create the conflicts. That late night call from an intoxicated Nixon to Frost in his hotel room never happened, but dramatically it works. Nixon was said to often make such calls after drinking and not remember them in the morning. Taking this notion of ‘What if…?’ Morgan creates an imagined occurrence and asks, ‘What if Nixon called Frost and went on a strange rant?’ “I will come at you with everything I’ve got,” his character warns Frost over the phone. This builds the tension for the final round, prepping audiences to expect sparks to fly, plus it gives Frost’s character that extra shot of adrenaline at a time when theatrically he really needs it. Presentation issues aside, iTheatre Collaborative’s final production of the season still grabs attention. With a running time of 105 minutes with no intermission, the play effectively holds you right up until that moment when Nixon declared “When the president does it, that means it’s not illegal.” You know it’s coming, but such is the force of the moment, delivered with power by Haines, that when it occurs, you momentarily hold your breath. It’s a payoff that Morgan’s use of dramatic license has been leading to, and it doesn’t disappoint when it comes.